In a brazen series of coordinated attacks, gunmen struck 10 sites Wednesday night across India’s financial hub, killing scores of people and taking hostages in two luxury hotels frequented by Westerners, officials said. Mumbai police spokesman Satish Katsa put the death toll at 87 and another 185 wounded, with nine of the attackers killed. 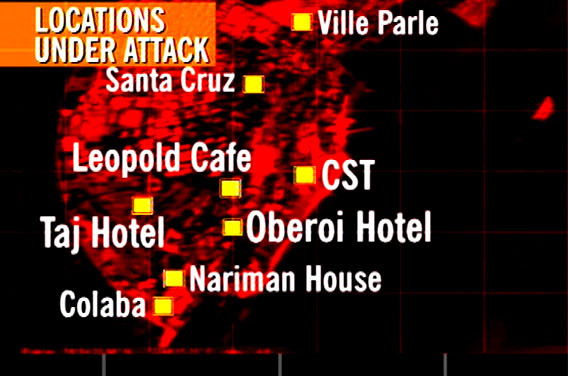 More than six hours after the attacks, fighting was still reported in the Taj Mahal Hotel, the Hotel Oberoi and Colaba Market, site of a number of restaurants, he said. Vilasrao Deshmukh, chief minister of Maharashtra state, where Mumbai is located, told reporters that a total of 10 locations were attacked, including a railroad station. Another hostage situation was occurring at Cama Hospital for women and children, CNN sister station CNN-IBN reported. Bhushan Gagrani, a spokesman for Maharashtra, said no one had claimed responsibility for the attacks. But several Indian news outlets reported receiving e-mails from a group calling itself the Deccan Mujahedeen that took responsibility for the attacks. CNN was not able to verify the reports. Gagrani said nine suspects were arrested and three people were detained for questioning. You are currently browsing the Free to share your thoughts blog archives for the day Thursday, November 27th, 2008.